Leading Wholesale Supplier of universal shoulder immobiliser, pouch arm sling (baggy), cast cover (arm), (elastic shoulder immocse), pouch arm sling (tropical) and cast cover (leg) from Chandigarh. 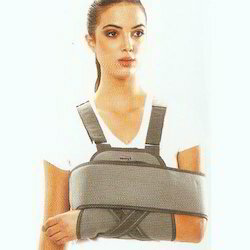 We are one of the preeminent organizations in the market, offering a comprehensive range of Universal Shoulder Immobilizer. 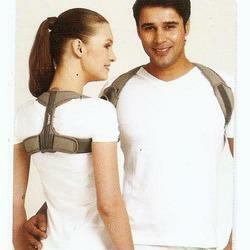 Double straps on the shoulder divide the load uniformly and improve comfort. Its three-layered PUF fused fabric offers durability, soft feel. Our vendors manufactured this product using excellent quality of material & contemporary techniques by vendor’s highly skilled technocrats as per the norms of industry. Being a client-centric organization, we are engaged in offering a wide array of Pouch Arm Sling (Baggy). 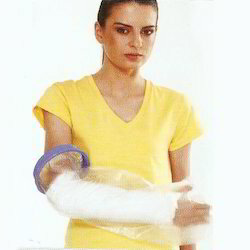 Our offered arm sling is manufactured keeping in mind the set norms of industry utilizing premium quality material & leading techniques. 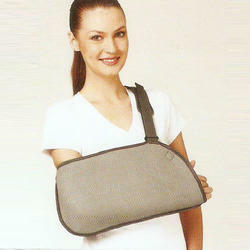 This arm sling is used for maximum support and coverage of the arm and can accommodate bulky casts. 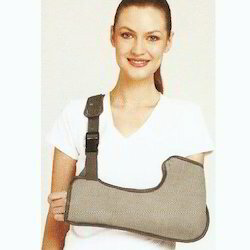 We provide this arm sling from us within a committed time frame at market price. Backed by a team of adroit professionals, we are wholesaling and supplying an extensive array of Cast Cover (Arm) that is durable, non sticky & light weight. This cast cover’s anatomic shape ensures that the hand remains functional. Our cast cover is manufactured utilizing the utmost quality material and latest technology at vendor’s hi-tech manufacturing unit. As well, our cast cover is accessible in numerous specifications according to the demand of patrons. To serve the requisite demands of our clients, we are engaged in wholesaling and supplying a qualitative range of Elastic Shoulder Immocse. The available products are manufactured under the direction of vendor’s professionals using supreme quality material following set standards. 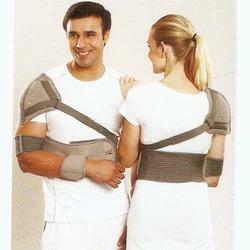 These products provide immobilization & comfort. Customers can easily avail these products from us on diverse specifications. Smart, sleek and open design,better ventilated. Three-layered PU bonded fabric offers durability, soft fee plush looks, and wrinkle free property. Easy closing and opening of buckle allows easy application and closing of the product. Adjustable "Ethafoam" shoulder pad takes the load of the aim Optimal positioning of the arm can be done by the adjustable sling. Expandable rubber diaphragm accommodates different dia's of legs makes water tight seal, allows easy pull on application. Rigid ring offers easy to wear, self sealing mechanism. Transparent flexible body is non porous, with pleasing aesthetics, is durable, non sticky, & lightweight. Anatomic shape ensures that the hand remains functional. Claw buckles ensure no loosening with time, better tightening and grip. Buckle pad ensures full protection from buckle bite. PU foam padding ensure no underarm rash, better comfort and compliance. Figure of eight design with lateral vector ensures linear union of the bone, easy application and tightening of the brace. Plush fabric covering offers skin friendly interface. Strong & water proof upper protects the plaster cast from wear/tear and mechanical damage. Prevents soiling & wetting of the cast. Lightweight improves patient compliance. Tapered sole Improves balance and restores normal gait also helps in early ambulation. 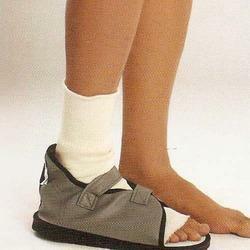 Hook loop tape ensures flexible sizing, easy application & removal of the Cast Shoe. Looking for Fracture Aids ?